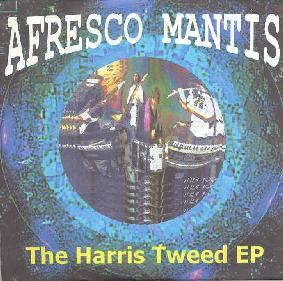 Afresco Mantis - "The Harris Tweed EP"
Neighbors and friends of Mr. Quimby's Beard, The Afresco Mantis is yet another entry on the Sunderland spacerock scene. Flute and synth player Kidd is the tie to MQB, being of both bands, and he is joined by Chris on drums, Polly on guitar, synth and vocals, and Fozzy on bass. On The Harris Tweed EP (which is pretty much a full length disc) the band displays a heavy Hawkwind styled spacerock not unlike that played by their Sunderland brethren Mr Quimby's Beard, but even at times reminds me of Krel and Spacehead. The band's magnum opus is the 27 minute "Harris Tweed", a deep space tune that features heavy guitars, wildly swirling space synths, a low thudding bass, and dark sinister vocals. The promo material explains that the song started as a 5 minute tune and developed over time to its current length through jamming. And a jam tune is exactly what this is. The track is an extended exploration that grooves along but can also be quite intense with its rolling beat, trippy guitars, chanting vocals, and space synth madness. Kidd's flute comes in late to give a more cosmic floating feel, as it does at various points throughout the song's four parts. And the four parts segue so smoothly from one to the next that the song's length is not only justified but I couldn't imagine it being any less. A great tune that I've grown to love over the past year. "Arizpheric Bush" opens with a plodding bass line, the rush of ocean waves and birds chirping overhead, and a trippy psychedelic flute. The music is similar to Harris Tweed but feels darker and perhaps a bit sinister. There's a dreamy segment similar to Tangerine Dream that includes heavy repetitive synth lines at the forefront with cosmic flute tripping alongside it. On "The Prophets Will Go To The Fish", Afresco Mantis offer spacerock's long awaited tribute to Laurel & Hardy. As a longtime L&H fan myself it was odd but very cool hearing Stan's voice and classic whimpering on a spacerock piece. In summary, spacerock fans run quickly to check out Afresco Mantis as I think they're going to become a force on the scene. You can visit Afresco Mantis at the Freaki Fungi web site. While there you can listen to this ENTIRE album online in RealAudio.